Overwatch announces Zhuge Liang Zenyatta as the newest Lunar New Year event skin – AiPT! Tuesday evening Blizzard announced that Zenyatta would be the latest hero to receive a new skin for Overwatch’s upcoming Lunar New Year event, The Year of the Pig. “Experience festivity. Embrace the Year of the Pig as ZHUGE LIANG ZENYATTA!” Tweeted Blizzard via the Overwatch Twitter account. 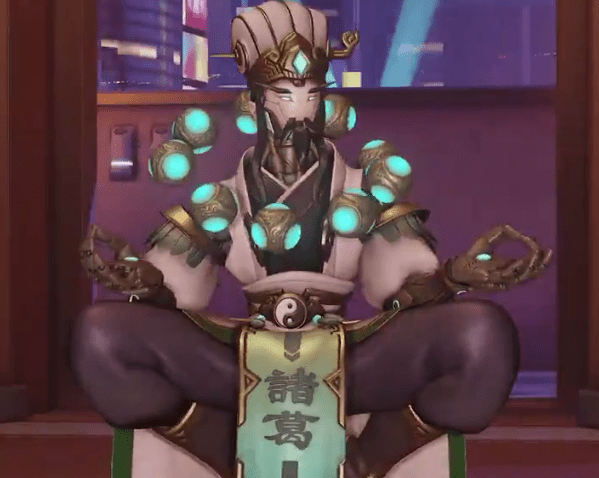 Zenyatta’s skin is inspired by Zhuge Liang, a Chinese politician, military strategist, writer, engineer and inventor that served as chancellor and regent of the state of Shu Han during the Three Kingdoms period. Liang is recognized as one of the most accomplished strategist of his era, with his intelligence and skills as a scholar having such a reputation that he was compared to Sun Tzu, the legendary author of The Art of War. As with the four heroes before him: Zhang Fei Torbjörn, Guan Yu Reinhardt, Huang Zhong Hanzo, and Lü Bü Reaper, Zenyatta’s skin is inspired by the 14th-century novel Romance of the Three Kingdoms. There were five prominent figures from Imperial China’s past featured in the novel, so with Zenyatta being the fifth hero announced to receive a new skin, it’s likely that any remaining heroes will be drawn from other parts of China’s past. This skin feels especially appropriate for Zenyatta, given that his character is a philosopher and writer that has had several political dealings with the Omnic movements. On the back of the white robe of the new skin is the yingyang symbol in black and white, while a tabard with Chinese symbols hangs down the front of his robe. Zenyatta is sporting a white Chinese style head dress with a golden dagger thrust through it. Players should expect a Competitive Capture the Flag mode along with the unranked version, and a new map exclusive to the CTF game mode. Both have been mainstays of every Lunar New Year event since the Year of the Rooster in 2016. As with every Overwatch event there will be a pile of new cosmetic items players can earn, but due to the event starting on a Thursday, we advise waiting to earn your arcade loot boxes to ensure you earn event themed cosmetics. The Year of the Pig Lunar New Year event begins Jan 24 and ends Feb 18.